A highly social marine mammal, Long Finned Pilot Whales, aka Globicephala melas, are often found in large pods of around 100 animals. Although they are actually dolphins, they often behave more like whales. They also appear similar to the Orca Whale (also a member of the dolphin family). They are jet black with a patch of white on their bellies and a faint grey smug behind the dorsal fin which represents a saddle patch. Their most distinguishing feature is their melon like heads and little or no beak. 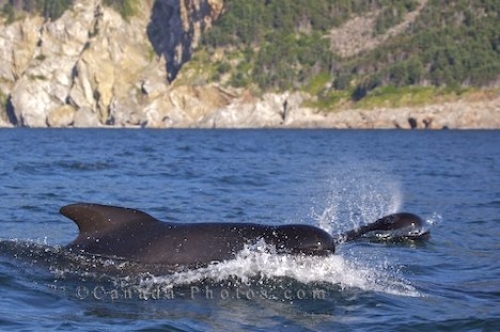 Their dorsal fin is broad based and quite forward on their bodies while their tail is stocky. Picture of two long finned pilot whales, Globicephala melas, in the Gulf of St Lawrence, Nova Scotia, Canada. ... The length of the Long Finned Pilot Whales flipper is between 18-30% the length of the animal's body whereas in the Short Finned Pilot Whale the length of the flippers is between 14-19% of the length of its body. Preferring cooler waters, there are two populations of Long finned pilot whales, Globicephala melas, one is found in northern Atlantic waters, and the other is found in southern ocean waters.